The leadership of Company C was about to be sorely tested over the next several weeks. Though greatly challenged, the company’s leaders would rise to the occasion. 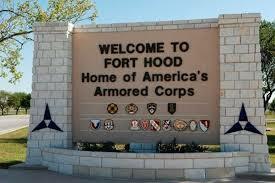 Fort Hood, Texas is an immense piece of real estate. The Army started developing the post in 1942 as a location to form and train its new tank destroyer force. The main part of the installation stretches some 25 miles tom the north of small City of Killeen, Texas. Another significant part of the installation still contiguous is west and south of Killeen. Two extensive cantonments of permanent facilities have been constructed adjacent to Killeen in the south and another on the northern extremity just south of the town of Gatesville, a town that developed around the earlier pre-Civil War Fort Gates. The some 25 mile by 25 mile northern fort in between the two cantonments has a vast maneuver and gunnery area. This area is bisected roughly mid way west to east by the Cow House Creek. The creek starts forming into the large dammed Lake Belton impoundment about two thirds of the way from west to east across the fort’s territory along the Cow House. There is a strip of maneuver area running north to south about 8-10 miles wide on either side of a central gunnery impact area about 10 or so miles north to south and 5 or more mile wide tapering at the north and south extremities. Two parallel roads run between the cantonments one on the east side and one on the west generally running near the different gunnery ranges and the impact zone. Each is paralleled by a “tank” trail for tracked armored vehicle travel. The Army was beginning its disengagement from the Viet Nam involvement and reorienting on the most likely threat at the time, Soviet operations in Europe. The expectation was an environment of intense fires and movement where heavy armored forces would dominate in a rapid maneuver scenario. That said, the Army also wanted to explore how operational experience in Viet Nam with air assault capabilities that could rapidly insert and extract light forces as armored force kill zone shapers, ambush and raid elements on softer targets, and stand off rapid repositioning tank and armored kill capabilities with emerging attack helicopter systems might have combat multiplier effect to an upgraded force capable of destroying large scale heavy force attacks. The necessity of leveraging even highly more capable replacement armored systems with some other more flexible and lethal armored killing capability was a necessity based on the estimates of force the Warsaw Pact could deploy. To examine the possibilities and identify direction that the Army might take with existing and emerging helicopter and armored vehicles lethality systems, the Army planned and conducted Air Cavalry Combat Brigade Tests I and II at Ft. Hood over a nine month period. Supporting the test was a reorganized 1st Cavalry Division consisting of an armor heavy brigade of two tank battalions and a mechanized infantry battalion, an air assault brigade of three air assault infantry battalions, and an air cavalry brigade of three air cavalry squadrons. The division had enhanced helicopter assets well beyond an armored, mechanized, or infantry division’s assets to support mobility requirements of the air assault brigade. The division was styled the Tri-Capability Division (TRICAP). Units of the division were, in the test scenarios, deployed in force on force operations against units of 2nd Armored Division. Ultimately, it was determined to conduct a division on division multi-week force on force exercise, the first since before the Viet Nam War. The exercise was titled Gallant Hand. To conduct such a massive exercise even on the extensive real estate of Ft. Hood would require that as much of the northern 25 by 25 mile terrain box be available for unit movement and maneuver. To create this land availability meant that a physical removal of unexploded ordnance exercise would need to be conducted over the entire acreage of the gunnery range impact area—a huge some 50 square mile expanse. Dud producing ordnance of all types from small caliber to 155mm and 8” rounds as well as aviation delivered ordnance had been pouring into the impact zone since 1942. In 30 years, the impact zone was a virtual open air ordnance museum with hundreds and thousands of rounds on the surface and burrowed into the ground, the latter bubbling up to the surface as cold and hot weather and freezing and thawing moisture caused the rounds to surface over time. Much of this collection was unexploded and as such not stable. To safely travel on the ground, especially with armored and other vehicles, the surface ground needed to be scoured of any dud ordnance. The huge area was broken up into sectors that were assigned down to company size units. The removal of unexploded ordnance exercise would take a week. The weather had already started to register in the 90 degree Fahrenheit range. Though there were many open areas of ground, there were also areas with significant stands of a low growing cedar that could sometimes be very dense. The trees grew to heights of 15-20 feet but most stands stood at 10-15 feet. The lower branches were typically thickly interwoven. Many lower dead branches had formed into several inch or longer sharp ended spike like obstacles to easy movement through the thicket—the units for eye safety would improvise protection. The plan for each company size unit was to form a line across a designated subsector and move slowly forward on line with designated leaders in a following rank. Explosive Ordnance Disposal (EOD) personnel were located centrally in rear. As the line moved forward dud ordnance was marked and not moved for later ordnance disposal handling. Prior to deployment, troops received comprehensive safety instruction that strictly prohibited individual handling or removing of dud rounds of any caliber from the sweep area. Examples of types of ordnance expected that had been disarmed was part of the instruction to ensure troops knew what the ordnance looked like and the danger it represented. Company C deployed to its sector, the first hour was hot difficult work, especially negotiating the cedar thickets while still detecting and locating dud munitions. Company C’s commander, a senior captain and outstanding officer, was a lead by example leader. He was out in front on company runs. If he ordered his soldiers to perform a task, especially an unpleasant task, he was there with them performing that task. He had deployed to Viet Nam twice, both times being wounded in action and evacuated. The second time he was commanding a mechanized company in combat when a shrapnel fragment destroyed an eye. The commander deployed to the company’s sector and proceeded to lead the company in the hot work ahead. The initial area was fairly open. About an hour and a half into the work, thick groves of the low growing cedar presented the company executive officer made his way to the company commander’s location and reminded the commander that he had critical business back in the company and assumed control of the company’s elements for the remainder of the day’s sweeps. The company completed its day’s sweep and returned for subsequent sweeps until the entire sector had been covered. At the end of each day EOD personnel consolidated the ordnance located into piles that were detonated. The ordnance found was truly collection of almost every form of dud producing munition used by the U. S. Army from 1942 to the time of the removal exercise. A majority of the ammunition found was 37mm, 57mm, 75mm, 98mm and 105mm and a selection of other type munitions. On completion of the last sweep, the company reported mission completion. Company C along with approaching 200 other companies of the army corps assigned to the fort had completed the hot demanding work. The “battle field” was ready. The units returned to their barracks and motor pools to continue preparation and training for Gallant Hand. Company C was a disciplined well trained company. Safety was a priority on the removal operation—officers and NCOs were focused on assuring no untoward handling of found ordnance or contraband found ordnance finding its way back to the barracks—conducting physical checks of all personnel before loading trucks after each sweep day before returning to the cantonment. Company C suffered no casualties due to mishandled dud rounds found or contraband that made its way back to cantonment. Sadly several situation developed where troops in other units were seriously injured, one a fatality. The postscript: Company C and the other units of the 1st Cavalry Division (TRICAP) and the 2nd Armored Division subsequently deployed on the several weeks of Operation Gallant Hand. As with all major exercises of this nature, especially being a force-on-force operation, there were many lessons learned. That said, the units did very well. Company C especially performed very well, with many situations that made for great stories later, one being the company trains successful withdrawal from a major brigade thrust that had penetrated the forward position. The penetration was successfully counterattacked and the division’s forward position restored—the soldiers in the trains joked later how they’d counterattacked to their designated rally point without losing a single man or vehicle. Company C demonstrated on two tough missions, the dud removal and the gallant hand operation skill, ability, discipline and grit. In did so thanks to the involved leadership of its officers and NCOs and the reciprocity of the company’s soldiers to this effective leadership.